Explore the beauty and simplicity of this ancient form of basket making. 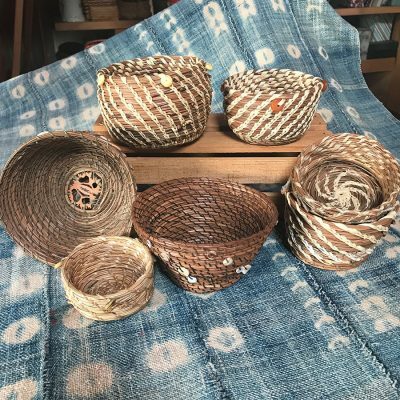 Learn how to work with pine needles to create a small coiled basket using the universal weaving technique of “coiling” — using a tapestry needle and waxed linen thread or raffia to bind the bundles of needles together as they spiral out and then up. Information about how to source materials including gathering, preparing, and preserving needles will be covered. All materials included. Judith Thomas was on the faculty of the East Bay Waldorf School for many years, as a class teacher and as the teacher of handwork. Currently she is a weaver, a bookbinder, and a basketmaker. She has taught pine needle baskets at the UC Botanical Garden, at the Waldorf School, and at the Richmond Art Center. As a grower of indigo, she is part of the Fibershed group of indigo growers and producers. She lives in Berkeley.